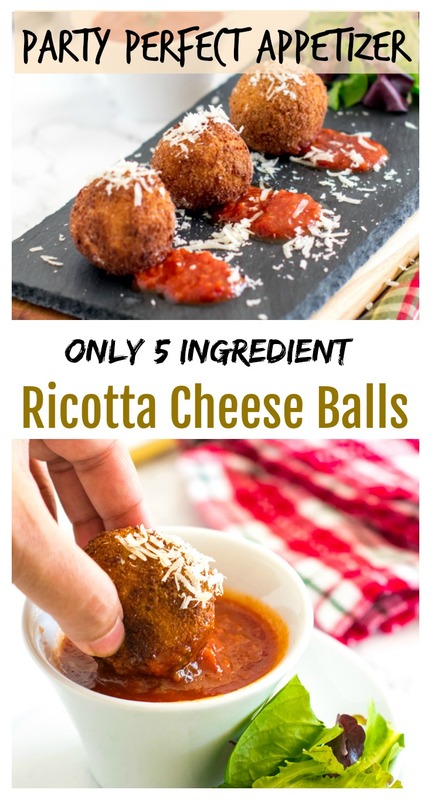 Crunchy from outside and mouth melting from inside these 5 ingredient Ricotta cheese balls come together less than 30 minutes. If you are looking for an easy peasy make ahead of time appetizer for your next party or potluck then you should bookmark this recipe. These cheese balls are a hit among the kids so consider adding them to your kids party menu. Serve these cuties with the classic marinara or a dip of your choice. These Ricotta balls are surely a crowd pleaser . And be sure to make extras as these are quiet addictive. So don’t blame me if you see them polished off within minutes. There are 3 ways to make it . You can deep fry them – easiest way when it comes to large parties. Make them in appe pan/ aebleskiver pan – if you wish to make small quantities for your family only. Either ways they are absolutely delicious. This finger food is my go to recipe on a game day or a get together. I just keep changing the dip to go with it or sometimes add in some chopped veggies. Store bought Ricotta makes this recipe a breeze. If Ricotta cheese isn’t available in your country then fresh homemade chena/ paneer works the same way. You can prepare the ricotta balls ahead of time. Roll it in bread crumbs . Place the balls in a tray/dish . Cover it with plastic wrap and stick it in the fridge 2-3 days ahead of time. You may even fry a large batch hours before the party and store at room temperature. Just before serving warm them in the oven at 400 deg F for 10-15 minutes . Other recipe that you might like – Hariyali kebab – no deep fried. A party perfect appetizer made 3 ways with make ahead of time tips. Place ricotta cheese in a muslin cloth and remove as much water you can. Now place all the ingredients called to make cheese balls in a medium size bowl. Mix well and make lime size balls. Keep aside covered in the fridge. Mix flaxseed meal with warm water and keep aside for 5 minutes. It will turn into gel like consistency which will help coating the bread crumbs. Meanwhile prepare the coating station. Place cornstarch , bread crumbs , flaxmeal gel in 3 different bowls. Now take one ball and roll it in cornstarch . Now dip it in the slurry and coat well. Then dunk it in the bread crumbs and roll it well. Heat oil in a frying pan on medium heat . Once warm add in one cheese ball and see if it fries well and doesn’t break. Now go ahead and fry 4-5 balls at a time until golden brown. Repeat this with all the cheese balls . Place them on a paper towel to remove excess oil if any. Heat up the appe pan on low medium heat, brush every cavity lightly with oil. Once warm , add the balls and brush them with oil , cook them until golden brown overall. Rotate and flip them in intervals with a help of a small spoon or wooden skewer as needed to evenly cook . The appe pan method is quiet slow but results are worth it. Alternatively you can bake them. Serve warm with a side of your favorite dip , ketchup or chutney. Place all the coated cheese balls in a baking tray lined with foil and lightly brushed with oil . Brush each ball with oil. Bake for 15-20 minutes, flipping them mid way or until light golden brown. Condiments are used for elevating the flavor , you may use or skip them. Use store bought bread crumbs or baked bread crumbs for outer coating . Instead of flaxseed meal gel you can use cornstarch slurry. Make ahead of time tips. You can prepare the ricotta balls ahead of time. Roll it in bread crumbs . Place the balls in a tray/dish . Cover it with plastic wrap and stick it in the fridge 2-3 days ahead of time. You may even fry a large batch hours before the party and store at room temperature. Just before serving warm them in the oven at 400 deg F for 10-15 minutes . Want to make Ricotta cheese at home ? Here is a link on how to make Ricotta at home. These eggless cheese balls turned out great . I made for school fair . The kids went crazy for it . Yum. Karen , the bread crumbs help bind the ricotta. If you have luck without using this quantity then by all means you may reduce it. Or use oat flour, cornstarch or almond flour . We do not consume eggs and bread crumbs does the trick . Use as per your preference. Have a nice day. I buy ready made one. It is nothing but ground flax seed. You can make it in a spice grinder. Thank you Ganga, it is mentioned in the very 1st point of the recipe instructions- slurry one. Super recipe! But how to make flaxseed gel? Hi how do you make the flaxseed meal??? Awesome Shashi.. do let me know how it turned out! Thank you Shubha.. it sure is! These Ricotta cheese balls are awesome!! !